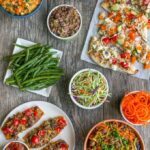 Here are 25 Healthy Snack Ideas for those nights when you get home starving because you haven’t eaten since lunch but it’s not time for dinner. Let’s talk about some healthy snack ideas today. I’ve always been a big snacker. I can’t make it through an afternoon without one. Hubby doesn’t snack at work, but it’s pretty much the first thing he does when he comes through the door in the evening. Since we eat dinner pretty late around here (8 or 9pm), he needs something to give him an energy boost to play with Squish, workout, etc. Lately he’s been falling into a bad habit of eating nothing but handfuls of nuts when he gets home. Nuts are a great snack option, however, 2 cups of nuts per day is not. When I told him he needed to cut back, he complained that he didn’t know what else to snack on. 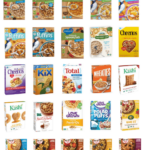 So, a couple weekends ago I started brainstorming healthy snack ideas and took it upon myself to make sure we had lots of them on hand for him to munch on! Don’t go overboard. It’s supposed to be a snack (a mini-meal), not a full-sized meal. 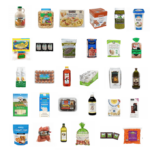 Choose real food whenever possible – homemade options are great! Always include protein. Pair a few things from the list below together to make sure you’re always getting a balanced snack! Tuna Quinoa Cakes – You can also make these with salmon, or probably even chicken if you used a food processor to chop it up. 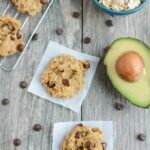 I often make a double batch because they’re a great post-workout snack! Sweet Potato Bites – Experiment with mix-ins to find your favorite! Fruit + nut butter – Hubby likes apples but you could also try dates, bananas etc. Edamame – A great vegetarian source of protein. Buy it frozen and pre-shelled so all you have to do is heat it up! Nuts + seeds (or trailmix) – Grab a small handful of nuts – almonds, walnuts, pecans, cashews, etc or seeds – pumpkin, sunflower etc….or make a batch of homemade trailmix if you like variety- a mix of nuts and seeds with other add-ins like dried fruit, roasted chickpeas, cereal. Cottage cheese – Mix with fruit to add sweetness or pair with tomato slices and black pepper like hubby does. Yogurt – Look for lower sugar options (like Siggi’s) or choose a Greek variety for extra protein. Try making a parfait – plain yogurt mixed or layered with a little granola or fruit for sweetness. Cheese – Stick to just an ounce or two – eat it sliced with crackers or try string cheese for a grab-and-go option. Veggies + hummus – I always try to have carrots and broccoli cut up to dip in hummus. Don’t like hummus? Try a different dip- maybe greek yogurt ranch or one made with black beans. Tuna salad – We love tuna salad on crackers, chips or cucumber slices for an easy snack. Don’t like tuna? Try it with salmon or chicken! Try my Curried Tuna Salad or Tuna Salad with Avocado to get started. Hard boiled eggs – Eat them plain, turn them into deviled eggs or add some hot sauce for a kick. Don’t forget you can “hard boil” a big batch in the oven on the weekend to have on hand. Sliced meat – Buy deli-style – (look for low-sodium) or make a Crockpot Rotisserie-Style Chicken to have extra meat on hand. Make half a sandwich and add avocado for some healthy fats. Jerky – It’s not the best choice for every day since it’s often very high in sodium, but it’s a good source of protein and good for traveling. Energy Balls – I love stocking our freezer with these because it’s easy to make a huge batch and then have them on hand for a while. Plus you don’t have to bake them! There are endless flavor combinations – most start with dates and nuts/seeds and then add additional flavors. Try my Pumpkin Energy Balls or checkout this roundup. You can also add protein powder if you want. Froyo bites – Start with plain yogurt, or a mix of flavored and plain to cut down on the sugar and then mix in your favorite granola, nuts, fruit, etc. Freeze in a pan and cut into bars or spoon into ice cube trays for bite sized snacks. Smoothie – Make sure to include a protein source like yogurt, protein powder or silken tofu, then add fruit for sweetness and healthy fats like avocado, nuts and seeds, nut butter, etc. Feel free to add some green veggies as well! Popcorn – Make some Healthy Microwave Popcorn and eat it plain, mix it in trailmix or top with your favorite spices/seasonings. Protein bars – It’s super easy to make a batch of these Homemade No Bake Protein Bars to have on hand during the week. 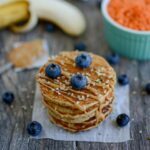 Sweet Potato Protein Pancakes – Make a batch and add your favorite toppings for a quick snack. Veggie Chips – Experiment with your favorite veggies like kale, sweet potato, etc. Homemade Granola Bars – Easier to control the ingredients and make them lower in sugar, higher in protein and fiber than store-bought! 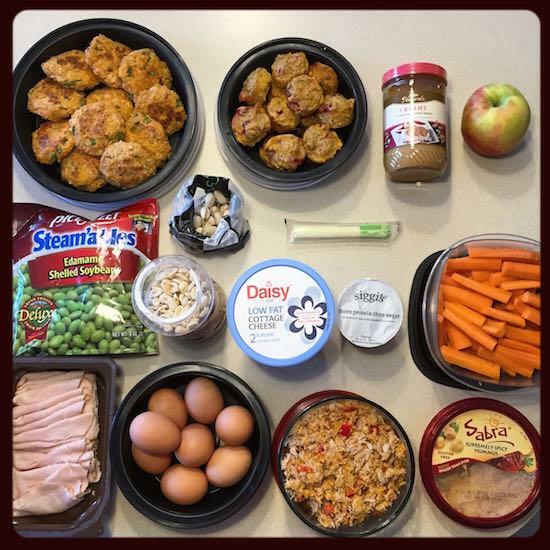 Egg Muffins – Mix eggs and veggies and bake in muffin tins. Grab 1-2 to reheat for a quick snack. 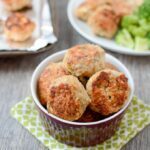 Mini Meatballs – Bake a batch of mini meatballs to keep in the fridge. Dip in guacamole or another quick dipping sauce. Sweet Potato + Nut Butter – Microwave the sweet potato for a quick snack or bake up several on the weekend and just reheat and eat. 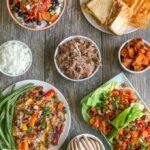 Leftovers – A small serving of dinner leftovers can make a great snack! Are you an after-work snacker? What’s your go-to snack? Hungry after work? 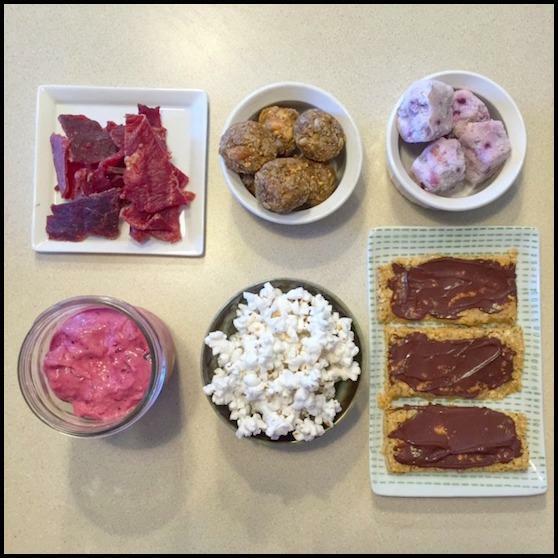 Here are 25 Healthy Snack Ideas from @LeanGrnBeanBlog! If you liked this post, you’ll love my ebook – The Ultimate Guide To Food Prep. 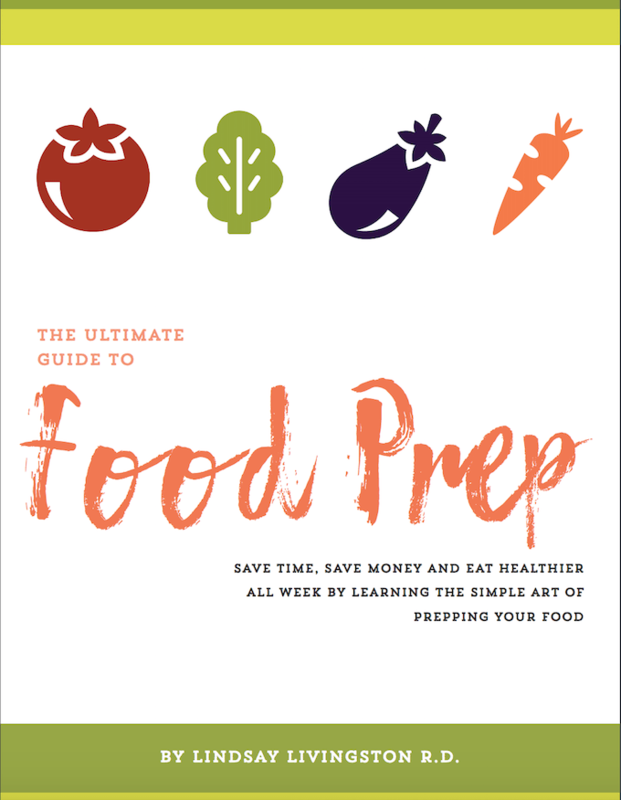 It dives into even more detail about how to food prep beyond snacks, troubleshoots common problems and provides tons of tips to make it easier! Click the image below for more details! I am sometimes when I don’t eat a snack earlier in the day and dinner seems so far away. I like nuts, fruit or veggies with almond butter or hummus with gluten-free crackers. That’s the current rotation! 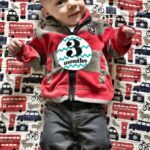 As a mother of 5 and now a grandmother I am always looking for great snack ideas as kids mostly eat small snack like meals all the time. This is a great list of snack ideas. Having a list is a great idea. I did this a while ago with meals for the family by asking each person what was their favourite 3 meals. Anytime I can’t think of what to cook I look at the list which is posted over the phone in the kitchen. It also helps with the shopping list. I’m the big snacker at my house too and have your husband Beat! Now just 2 cups of nuts, I’ll eat the whole bag after work – I literally feel as though I’m staring to death! Which is ridiculous because I’m not exactly wasting away to nothing around here. 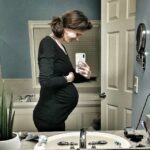 I’m going for your veggie and hummus option so I actually fit into my Spanx suit! After all, Spanx will do me no good if I can’t even fit into it for Spring break! ha. Oh I need these for after school for the child. shes picky and Im out of ideas. I feel your hubbies pain! Nuts are always a go-to snack for me. It fills me up! But like you said, 2 cups of nuts a day is not good! I’m always looking for good snacks for myself and the kids. Thanks! I definitely have to have a snack. I have long commutes and don’t generally eat dinner until 7pm. A homemade muffin, granola bar or apple is usually my snack on the run. i’m a TOTAL snack monster after work! yay! hope you find some good ones! Great and needed post!! Thanks! I find I always need a snack after work since I have a fairly long commute and don’t get home until quite late. Thanks for sharing since I’m sure I can find something here! yay! hope you find some you like! Great ideas in here Lindsay! I am a BIG fan of the sweet potato and nut butter combo. It never ever gets old, and it’s perfectly filling! Ah, sweet potato bites are a good option! I’m surprised you’re a big snacker! I am not! What a great list! I love tuna salad (made with greek yogurt) fresh out of the can but I’m not sure I could stomach tuna cakes a day later.. But the sweet potato bites I’d love to try! Thanks for sharing! they’re one of my favorites! This is making me feel less-guilty for pounding nuts after work like I’m being paid to do so. haha you’re not the only one! Lindsay! Thank you so much for linking over to my roundup of no-bake bars and bites. I’m so glad we’ve gotten to know one another through social media 🙂 You’re fabulous! Love all of these ideas! We are big snackers at our house too. Recently I’ve started keeping hard boiled eggs, sliced veggies, and hummus in the fridge. It helps having a variety of healthy foods to choose from! I love telling clients about edamame! When I show them the food label they are so shocked how much protein it has. It is also great for those who love to just chew and have something to much on like ex-smokers! me too! great protein source! These are great recommendations. I really like fueling with real foods, it satisfies so much more than a bar or a protein shake. Thanks sarah! glad you liked them! I would rather eat three square meals a day than snack, but sometimes if I do a cardio-heavy morning workout I find myself reaching for protein bars around 3pm – usually ThinkThin or Quest. I think I’ll make more of an effort to set aside “real” food next time I know I’ll be hungry in the day! yay! hope it goes well! I eat a lot of apples during the work day and have to have some sort of snack by by the late afternoon…otherwise when I get home, I eat too much before dinner. i hear ya! me too! If I couldn’t like Mr.Bean anymore, I now do- Cottage cheese with tomato and pepper! YES! I am a huge snacker too, moreso in the afternoons. Love homemade energy bites and…handfuls of nuts. Oops. he loves that tomato cottage cheese combo, especially in the summer! I love snacking and always hate when I don’t have enough healthy ones around. I try and keep a lot of variety, but I don’t always do the best job. I like to make homemade almond butter and eat it with either dates or apples. So good. Thanks for so many options!! they’re delish! we have a batch in the fridge right now! Thanks for these ideas! I’m excited to try those frozen yogurt bites – yummmm. And I already love grabbing some edamame after work already, so I’m glad you included it so other people will try it too. I am a BIG fan of snacks! Between having a toddler, teaching multiple BODYPUMP classes a week, and having a husband who often works nights, our family THRIVES on snacks. Great round up!